The Palestinian Center for Human Rights (PHRC) said in a new report that three Palestinian fishermen were injured while ten others were arrested while sailing in Gaza sea over the past two months. The monitoring report said that Israeli forces continued their violations against Palestinian fishermen while sailing in the fishing area allowed for Palestinian fishermen. 13 shootings were documented against Palestinian fishermen during the reported period, resulted in the injury of three of them. Ten fishermen were arrested, while five fishing boats were confiscated, according to the report. 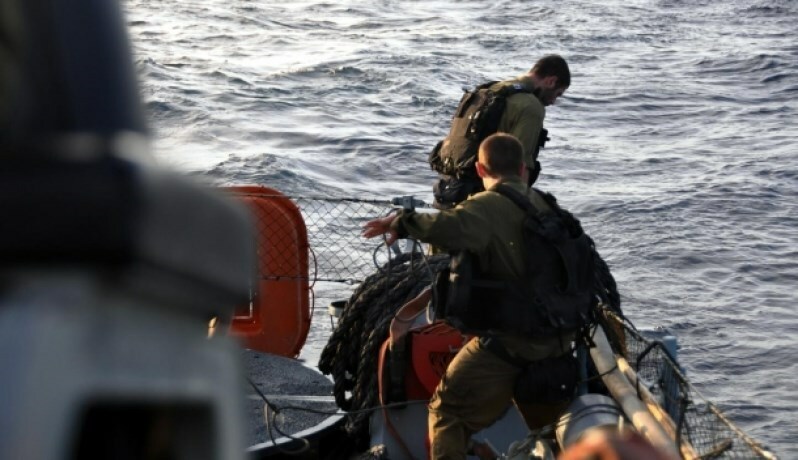 The report pointed out that Israeli Navy violated in more than incident the ceasefire agreement reached between the Palestinian resistance and Israeli authorities under Egyptian mediation which allows the fishing area up to six nautical miles offshore. All the reported Israeli violations were carried out in the allowed fishing zone, the report affirmed. According to the center, preventing Palestinians from accessing their lands and fishing areas violates numerous provisions of international human rights law, including the right to work, the right to an adequate standard of living, and the right to the highest attainable standard of health. A newly-released report found out a striking upsurge in the number of Israeli illegal settlement units built across the West Bank. 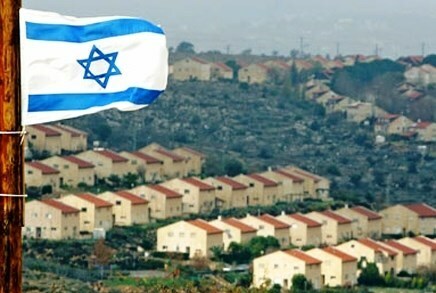 The number of illegal settlement units increased by 54.8% in the first half of this year, compared with the first six months of last year, the Israeli Central Bureau of Statistics (CBS) reported on Wednesday. Similarly, there was a 49.6% jump in the number of settlement units in the same period, the CBS said. In terms of real numbers, the 983 units in the West Bank make up 3.9% of the new settlement units started by the Israeli occupation this year. Similarly, the 1,017 finished settlement units equal 4.7% of the overall units completed the first half of this year. In terms of geographical distribution, Occupied Jerusalem surged to a record high in the number of illegal settlement units. 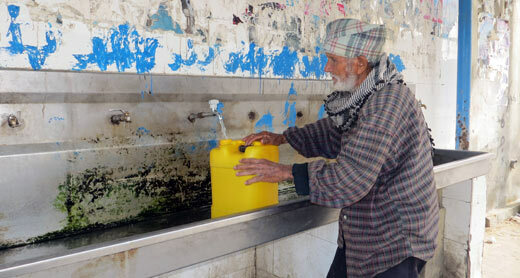 Ibtesam Kheir a-Din, 48, a married mother of six lives in a-Sultan neighborhood, Rafah, related to B'Tselem, “The water we get is salty and unfit for drinking. Sometimes it even smells bad. We use it only to clean the house and do dishes and laundry, but nothing ever feels really clean. The clothes sometimes smell bad and get stained. The water also ruins the washing machine. We've fixed the machine several times, which cost us 50 to 70 shekels [approx. 14 USD – 20USD] every time, and the technician said the problems were caused by the too many salts in the water. We don't drink the water or use it for cooking. For cooking and drinking, we buy water every day from vendors who go around the neighborhood or from shops that sell water containers. We buy 50 liters of fresh water a day, at two shekels [approx. 0.6 USD] a liter. The UN says that 500,000 people have been displaced in Gaza as a result of last year's IDF operation alone. More than 20,000 Palestinian homes were destroyed, and 148 schools and 15 hospitals and 45 primary health-care centers were severely damaged. Gaza is one of the most densely populated areas in the world. There are still 200 Palestinian children, one-third of them from Occupied Jerusalem, in Israeli jails, according to a report released on Sunday by the Palestinian Prisoner Center for Studies. The center stated that the detention of children in the holy city had escalated last year and in recent months, where the Israeli occupation police carried out 600 arrests against children in 2014 and more than 500 arrests in the first eight months of 2015. The report affirmed that 60 children, about 30 percent of the total number of the kids in Israeli jails, are from Jerusalem, pointing out that 28 of them were sentenced to jail and 32 others are awaiting court verdicts. 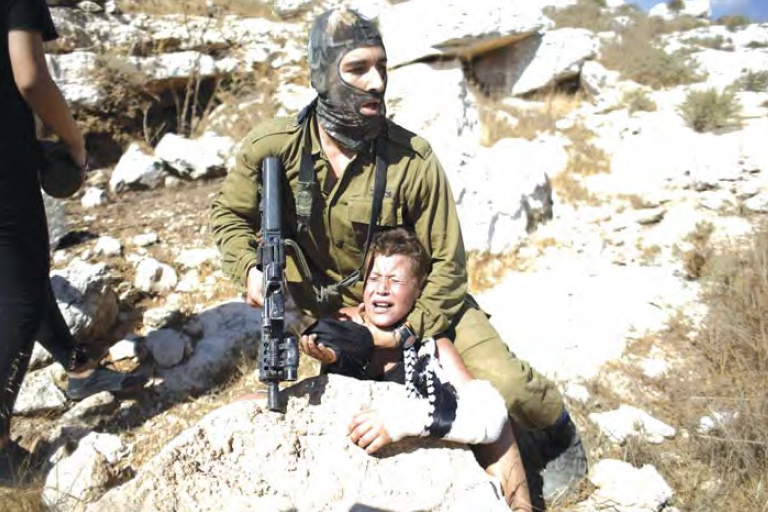 The report also highlighted the exposure of children in detention to intimidation and abuse at the hands of Israeli soldiers and interrogators, and their suffering from physiological problems after their release. The center called on international human rights groups to necessarily intervene to protect the Palestinian children against detention and abuse and provide them with legal and psychological support. Representative of the minor prisoners in Ofer, AbdelFattah Doula, who is sentenced for 15 years of imprisonment, on Monday said that the number of Palestinian minors in Israeli jails hit its highest in August, with the highest bails as well. In August, Doula said that the number of minors detained was 42, who were all under the age of 18. 13 of them are under the age of 15. Of all these prisoners, 23 were detained from home, five from checkpoints, four on the streets, nine after “reported” and one from workplace. Eight of the prisoners were brutally beaten during their arrest. Doula added that three of them went through long investigation periods, which lasted for 26 days, and others were detained more than once. Lawyer of the prisoners committee, Ibrahim Alaraj, said that 21 minors were detained in August, and their periods of imprisonment ranged between 6-19 months. Some received fines of 40,000 NIS in August alone. 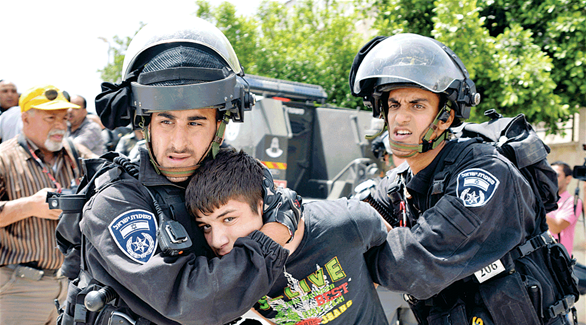 The total of fines imposed on the minors made 317,000 NIS (approx $806,000 ). Alaraj assured that the majority of the detainees were forced to admit “confessions” under violence and pressure. Alaraj said that 30 of the detained children suffer from health problems, including breathing issues, diabetes, or injuries of bullets during arrest. The prisoners received treatment before being detained, but the IPS does not allow them any medical follow-up or health check-ups. Alaraj pointed out that arresting children or detaining them for more than 24 hours is a flagrant violation of human rights. This includes medical neglect, preventing family visits, and putting them in waiting rooms with adults. The Palestinian Organization for Human Rights (Shahid) called for an international protection for the Palestinian people in light of what it described as "continued crimes committed by the Israeli Occupation Forces (IOF) including shooting, incursions, and break-ins into the Palestinian cities and towns." In its periodic report on Saturday, Shahid pointed to the Israeli unjust siege that has been imposed on the Gaza Strip for about eight years. The report also pointed out that the IOF has been imposing more sanctions on the civilian residents as part of its collective punishment policy pursued in the West Bank, which flagrantly violates all international human rights charters. The Israeli Knesset has approved the first reading of the "anti-terrorism" bill after 45 MKs voted in favor while 14 were against. Under this law, the punishment for committing any crime related to "terrorism" will reach 30 years imprisonment. The law is aimed at cracking down on the Palestinians under anti-terrorism pretexts, the report said. The human rights organization cited a statistics report issued by the Palestinian Ministry of Information indicating that the number of the Palestinian underage prisoners held in the Israeli prisons has increased to reach 301 children during the period from the beginning of April until August, 2015. In this context, Shahid called on the states parties to the Third and Fourth Geneva Convention 1949 to fulfill their international obligations stipulated in these two conventions and to shoulder their responsibilities vis-à-vis the Israeli violations in the occupied Palestinian lands. Shahid urged the Palestinian Authority to launch "a diplomatic campaign across the globe; so as to expose the Israeli crimes." It also urged the international community to provide all Palestinians with international protection. The organization also stressed the importance of prosecuting Israel, as an occupying power, for its heinous crimes committed against the Palestinian people. "The Israeli arbitrary arrests at Beit Hanoun (Erez) crossing in northern Gaza pose a serious breach of the International Humanitarian Law," the report further charged. The Applied Research Institute ARIJ revealed Saturday that August 2015 has witnessed an increase in Israeli demolition orders in occupied West Bank and Jerusalem. 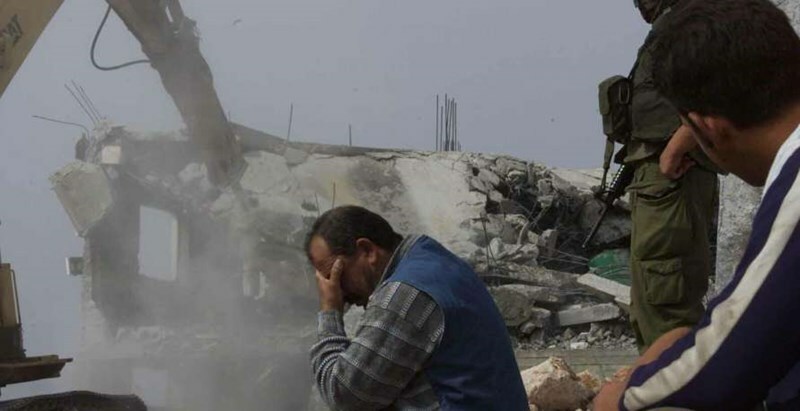 In its monthly report, ARIJ said that Israeli Occupation Forces (IOF) demolished 128 Palestinian homes and facilities, and notified nearly 60 others with demolition. 70 attacks were carried out by Israeli settlers over the past months, in which 130 olive trees were burned in Nablus and Bethlehem, the report added. Dozens of Palestinians were killed and detained during IOF nearly-daily raids and search campaigns carried out during the reported period, according to the center. Israeli Judaization schemes have also continued in occupied Jerusalem, while attacks on Palestinian worshipers have intensified during settlers’ break-ins into al-Aqsa Mosque. The report also pointed out that IOF violations of the ceasefire deal reached in August 2014 with Palestinian resistance have been notably increasing. Israel also continued to ban Gaza reconstruction materials’ access into the besieged strip of Gaza. The occupation authorities and Israeli settlers continued their violations in Al-Aqsa Mosque and their assaults on Jerusalemites and their properties in the month of August 2015. Wadi Hilweh Information Center (WHIC) monitored the violations against Al-Aqsa Mosque marked by imposing restrictions on the entry of female Marabouts and other citizens while allowing settlers to break into Al-Aqsa and carry out their tours inside its courtyards in addition to assaulting Al-Aqsa guards and the continuation of the isolation policy. In August, dozens of children and minors were arrested and settlers assaulted many young men and Jerusalemites’ properties. For the second consecutive month, the occupation authorities escalated its procedures and violations to the right to worship at Al-Aqsa Mosque and started implementing the procedure of “Temporal Division” of the Al-Aqsa between Muslims and settlers. They imposed a siege on Al-Aqsa and closed its gates and prevented women from entering in addition to imposing restrictions on the entrance of men and old people at times when they provided the settlers breaking into Al-Aqsa through Dung Gate with full protection under the umbrella of the so-called “foreign tourism”. WHIC explained that the occupation authorities closed most of Al-Aqsa gates on the24th and 25th of August (Lions, Ghawanmeh, Hadeed, Qataneen and King Faisal gates) and established checkpoints on the gates left opened (Al-Silsileh, Hutta and l-Majles). The center added that the occupation authorities prevented all women from entering Al-Aqsa from the morning hours until 11 a.m. during the last week of August which is the period when settlers are allowed to break into Al-Aqsa. The authorities did not only prevent but pushed and assaulted them with pushing and sound grenades while stationed at the gates. The authorities also barred 15-20 from entering Al-Aqsa for no reason and distributed their names at the gates upon a decision from the police. During August, the occupation authorities disrupted the entrance of summer camps’ children to Al-Aqsa and deliberately detained them at the iron barriers established at Al-Aqsa Gates for no reason. On the 2nd of August, the authorities imposed restrictions on the entrance of Muslims to Al-Aqsa and closed most of its gates from 7-11 a.m. and fired sound grenades and rubber bullets after they were stationed at Dung Gate to open the road for settlers to break in. The settlers’ assaults also rose in August as one French Jew raised the Israeli flag inside the courtyards of the Dome of the Rock and attacked Al-Aqsa guards with a sharp tool. The authorities arrested 7 of the Islamic Awqaf employees and one young man and several settlers raised the Israeli flag near Al-Silsileh Gate protected by the forces. The forces also assaulted three of Al-Aqsa guards and severely beat them and sprayed them with pepper gas while doing their work near Lions Gate; one guard was arrested and suffered fractures in his hand. The authorities also assaulted the Jerusalemite journalists to prevent them from monitoring the events at Al-Aqsa and its surroundings. The occupation’s municipality issued tickets for two photojournalists while recording the events at Al-Silsileh Gate; each ticket was 475 NIS under the pretext of obstructing the movement of people due to their photographic products. The forces also assaulted press crews and pushed them after checking their IDs. In August, the Israeli authorities isolated 37 Palestinians from Al-Aqsa Mosque for 10-60 days. Among those isolated were four minor girls, 7 boys, 4 women and 10 of the Islamic Awqaf employees. The occupation authorities continued its policy of arrest in Jerusalem and its villages and arrested 150 Jerusalemites in August including 70 minors, 6 girls and 11 women. Among the minor detainees were six under the age of responsibility (12 years) where the youngest was the 8-year old Mohammad Nader Abu Rmeileh who was arrested from in front of his grandmother’s house in the Old City of Jerusalem, 11-year old Mahmoud Wisam Abu Hummos who was arrested by the Musta’ribeen (undercover police) in the village of Esawyeh, 11-year old Mohammad Mahmoud Al-Hajj and his 12-year old brother Mutaz from Sheikh Jarrah, 12-year old Omar Mahmoud Shwayat who was arrested at Al-Aqsa gates and another girl. The arrests mostly occurred at Al-Aqsa gates and inside its courtyards where 50 Palestinians were arrested. The Old City of Jerusalem witnessed the highest number of arrests (45) followed by Silwan (25), Esawyeh and Beit Hanina (16 each), Al-Tur (12), Shu’fat refugee camp (7) in addition to other arrests from Al-Sowaneh, Wad Al-Joz, Sheikh Jarrah, Sur Baher and Jabal Al-Mukabber. The authorities also attacked three children from Silwan in an attempt to arrest them (aged between 5-9 years) and fired a sound grenade towards them putting them in a state of extreme fear. In an attempt to terrify and extract confessions from children during interrogation, the occupation authorities assaulted five children and stripped them down at Al-Qishleh police center; they were interrogated on charges of throwing stones inside Al-Aqsa Mosque. During the interrogation, they were detained in separate rooms that are not equipped with surveillance cameras. They were stripped down and searched and were also severely beaten. Also, bags with filthy smells were placed on their heads and the forces verbally assaulted them while they were handcuffed with the participation of the head of the investigation department. The occupation authorities demolished in August 5 residential and commercial establishments in Jerusalem (industrial zone of Atarot, Al-Tur, Wad Al-Joz and Jabal Al-Mukabber). The center explained that the authorities demolished a commercial building owned by Abu Diab family in Atarot north of Jerusalem that consisted of three floors, three rooms and two conference rooms. 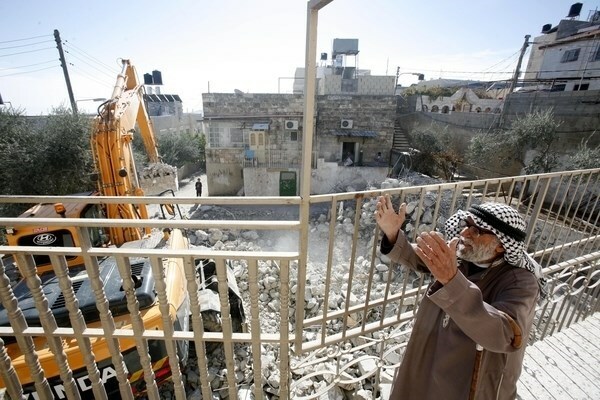 They also demolished a room used as storage space for Sha’lan family in Al-Tur, an under-construction building in Wad Al-Joz owned by Tutanji and Totah families that consisted of three floors and two residential houses owned by Abbasi family in Jabal Al-Mukabber. 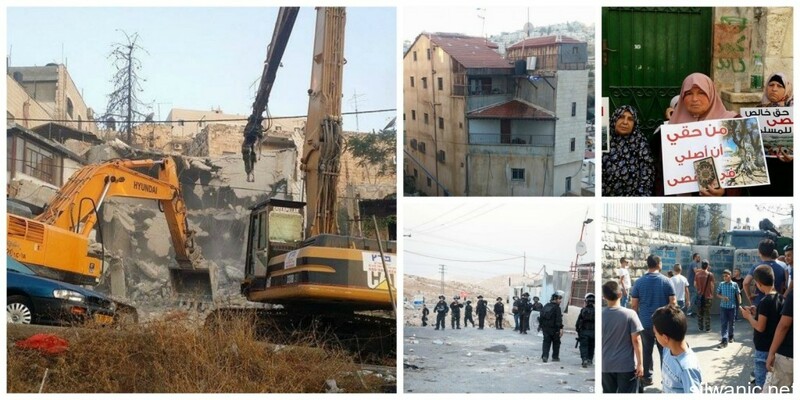 The authorities continued to distribute demolition order in Jerusalem especially in Silwan. They hung a demolition order on Al-Qa’qa’ Mosque in Silwan despite being established for three years; note that it is 110 square meters. The municipality also issued a demolition and removal order against Wadi Hilweh playground which is run by Madaa Silwan Creative Center which serves the children of Silwan. The occupation municipality’s court for “local affairs” issued an order to demolish and remove Wadi Hilweh playground which is 1500 square meters in addition to demolishing its facilities (a 15-square meters storage and a 40-square meters animals barracks) and also sweeping the plants and asphalt. The occupation authorities continued in August its policy of collective punishment against Jerusalemites by closing roads with cement blocks and soil. They closed in mid-August two entrances of the village of Esawyeh (eastern road leading to Z’ayem) and Al-Za’faraneh dirt road (used by farmers to get to their lands) and continue to closed the south-western entrance to the village for the 14 months. Towards the end of August, the occupation forces closed Suleiman Al-Farsi Street in the village which leads to the neighborhood of Al-Khalleh that has a population of nearly 4 thousand people. The street has three elementary schools (students aged between 4-12 years) and also includes the cemetery of the village of Mount of Olives, Suleiman Al-Farsi Mosque (one of the main mosques in the village) and Mount of Olives Club. The occupation authorities also prevented the Jerusalemite journalist Amjad Arafeh from travelling abroad for three months for security purposes. In violation of the right to education, the occupation authorities imposed restrictions on the entrance of Al-Aqsa Girls School’s students since the first day of the beginning of the new academic year. They conditioned the girls to only get to their school through Al-Silsileh Gate and often detain them once they arrive to the gate. After 7:30 a.m. they are only allowed to get to their school if accompanied by a teacher. The authorities also prevented the textbooks from being brought inside Al-Aqsa Schools and the administration was forced to distribute them in the streets. Settlers attacked three young men last month and injured them with bruises and wounds and also attacked the 22-year old Abdel Karim Abu Khdeir with stones while passing through the settlement of “Rekhes Shu’fat” that established on the lands of the neighborhood. Settlers assaulted Samir Bakri and severely beat him while he was in the settlement of Pisgat Zi’ev that is established on the lands of Beit Hanina. The Jerusalemite Ihab Salaymeh was also assaulted by settlers in “Street of the Prophets” in West Jerusalem. The center also monitored the writing of racist slogans in Hebrew in Street number 1. The settlement organization Ateret Cohanim increased their settlement activities in the neighborhood of Batn Al-Hawa “Middle Neighborhood” in Silwan and seized a 5-floor building after buying it from its owner Jamal Sarhan. The settlement organization also handed three families judicial reports to evacuate three houses in Silwan under the pretext of being owned by the Jews of Yemen. The month of August also revealed the organization’s intention to obtain permits to build a residential building with 3 housing units in the neighborhood of Batn Al-Hawa in addition to o widening the road between the settlement outpost “Bet Yonatan” and the new project. Settlers also started building religious pools near the settlement of Maale Ha-Zeitim established in the neighborhood of Ras Al-Amoud in Silwan south of Al-Aqsa Mosque. The so-called Nature and Parks authority confiscated a land adjacent to the walls of Al-Aqsa Mosque that is owned by Husseini and Ansari families and placed poles and barbed wires around it. The month of August also revealed a plan to build a huge domed building in the north-western side of the Al-Buraq Square adjacent to Al-Aqsa Mosque. The project is called “Fortress- Jewel House” funded by the Israeli government and a group of Jewish Communities specialized in the “Alleged temple” which form the so-called “The Western Wall Heritage Foundation”. According to the plan, the building will consist of 6 floors in which two will be underground and four aboveground and a total area of 1400 square meters with a height of 23 meters and cost of 13 millions USD. In its Weekly Report On Israeli Human Rights Violations in the Occupied Palestinian Territories for the week of 27 Aug. - 02 Sep. 2015, the Palestinian Center for Human Rights (PCHR) found that Israeli forces wounded 14 Palestinian civilians, including 3 children, while abducting 55. In addition, Israeli forces demolished a residential community, northeast of occupied East Jerusalem, and expelled 94 Palestinians, including 69 children, rendering them homeless. Israeli forces also stopped rehabilitation work in an archaeological site in the vicinity of Bani Na'im village, east of Hebron, while Israeli settlers set fire to a bulldozer in al-Mazra'ah al-Qabaliyah village, northwest of Ramallah. During the past week, 10 Palestinian civilians, including 3 children, were wounded during Israeli attacks on nonviolent demonstrations. 4 others were wounded during an Israeli incursion in Tal village, southwest of Nablus. Israeli forces conducted 57 incursions into Palestinian communities in the West Bank. 55 Palestinian civilians, including 12 children, were abducted. 11 of these civilians, including 4 children, were abducted in occupied East Jerusalem. In addition, a house was shelled and then completely levelled by an Israeli bulldozer in Jenin. In a large-scale military operation that Jenin has not witnessed for years, Israeli forces moved into the city and its refugee camp on 31 August 2015 to arrest allegedly wanted Palestinians. They raided a house belonging to the secretary of the Jenin's Mayor and took his family outdoors. Moreover, they abducted the aforementioned person, his brother, son and mother. Israeli forces afterwards fired 4 shells at the house. A bulldozer started demolishing the house, the fence around it and a well used for collection of rainwater. The child and his grandmother were released later. Many checkpoints were established in the West Bank. 3 Palestinian civilians were abducted at checkpoints. 8 shepherds were maltreated and an old woman was beaten by Israeli soldiers, east of Nablus. In an example of the many Israeli invasions this week, on the single day of Sunday August 30th, Israeli forces carried out incursions in the following areas: Hares village, north of Salfit' Kherbtha al-Mesbah village, west of Ramallah; Beit Sira village, southwest of the city; 'Aqbet Jaber refugee camp, southwest of Jericho; Fasayel village, north of the city; villages of 'Azoun, al-Fondoq and Hejah, east of Qalqilya; and Kufor Qaddoum village, northeast of the city. In the Gaza Strip, in the context of targeting Palestinian fishermen, on 29 August 2015, Israeli gunboats stationed off al-Wahah shore, north of the Gaza Strip, sporadically opened fire at fishermen sailing within 2 nautical miles, but neither casualties nor material damage were reported. Israeli forces abducted two Palestinian traders at Beit Hanoun crossing. In addition, on 01 September 2015, Israeli forces moved 200 meters into Nahal 'Oz area along the border fence, east of al-Shija'iyah neighbourhood in the east of Gaza City. Israel continued to impose a total closure and has isolated the Gaza Strip from the outside world. Israeli forces have continued to impose a total ban on the delivery of raw materials to the Gaza Strip, except for very limited items and quantities. The limited quantities of raw materials allowed into Gaza do not meet the minimal needs of the civilian population of the Gaza Strip. Israel has continued to close the Beit Hanoun (“Erez”) crossing for the majority of Palestinian citizens from the Gaza Strip. Israel only allows the movement of a limited number of groups, with many hours of waiting in the majority of cases. Israel has continued to adOccupied Palestinian Territories a policy aimed at reducing the number of Palestinian patients allowed to move via the Beit Hanoun crossing to receive medical treatment in hospitals in Israel or in the West Bank and East Jerusalem. Israel also continued applying the policy of making certain civilian traveling via the crossing interviewed by the Israeli intelligence service to be questioned, blackmailed or abducted. In the context of the forcible displacement policy applied in Area (C) in the West Bank for the interest of settlement projects, on 31 August 2015, Israeli forces demolished "al-Khdeirat" Bedouin community, northeast of occupied East Jerusalem near "Adam" settlement, rendering eleven Bedouin families homeless. According to investigations conducted by PCHR, at approximately 09:00 on Monday, 31 August 2015, Israeli forces, backed by military vehicles and accompanied by a force from the Construction and Organization Department in the Civil Administration and bulldozers, moved into al-Khdeirat Bedouin community near "Adam" settlement overlooking Mekhmas village and "Sha'er Benyamin" settlement, northeast of occupied East Jerusalem. The Israeli bulldozers demolished a number of residential and livestock barracks (16 residential barracks and 7 livestock barracks) leaving 94 persons, including 69 children, homeless. Israeli forces continued to use excessive and systematic use of force against peaceful protests organized by Palestinian civilians and Israeli and international human rights activists in protest at the construction of the annexation wall and settlement activities in the West Bank and Israeli policies in the Occupied Palestinian Territories. 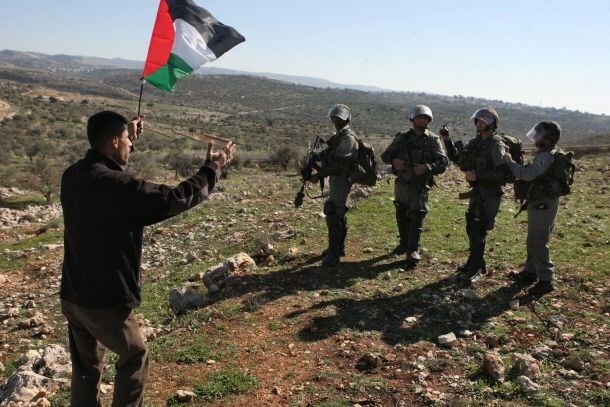 As a result, 9 civilians, including 3 children, were wounded in Kufor Qaddoum protest, northeast of Qalqilya; Silwad protest, northeast of Ramallah; and the vicinity of Ofer detention facility, southwest of the city. Following the Friday prayer on 28 August 2015, dozens of Palestinian civilians and international and Israeli human rights defenders organized a peaceful demonstration in Bil’in, west of Ramallah, in protest against the annexation wall and settlement activities. protestors tried to sneak the fence. Israeli soldiers stationed behind the wall, fired live bullets, rubber-coated steel bullets, tear gas canisters and sound bombs and chased them into the olive fields and into residential houses in response. As a result, many civilians suffered tear gas inhalation and others sustained bruises as Israeli soldiers beat them. Moreover, Israeli forces abducted the head of the Popular Committee against the Annexation Wall and Settlement Activities in Bil'in, Iyad Bournat, 43, after they beat him causing bruises to his chest, and a photographer of the Popular Committee, Hamza Bournat, 23. The two were taken to Benjamin police station, east of occupied Jerusalem. They were released at midnight. On the same day, dozens of Palestinian civilians organized a peaceful demonstration in the center of Ni’lin village, west of Ramallah, in protest against the Annexation Wall and Settlement Activity. The demonstrators took the streets and headed to the annexation wall. Israeli forces prevented the demonstrators from crossing to the land behind the Annexation Wall, so they threw stones at them. Israeli soldiers fired live bullets, rubber-coated metal bullets, sound bombs and tear gas canisters at the civilians, and chased them into the village. As a result, many civilians suffered tear gas inhalation and others sustained bruises as Israeli soldiers beat them. Around the same time, dozens of Palestinian civilians and Israeli and international human rights defenders organized a peaceful demonstration in al-Nabi Saleh village, southwest of Ramallah, in protest against the annexation wall and settlement Activity. The demonstrators headed to the lands that the settlers are trying to rob by force near “Halmish” settlement. Israeli forces had closed all the entrances of the village since the morning to prevent them from participating in the demonstration. When they arrived at the aforementioned land, the demonstrators were met by live bullets, tear gas canisters, rubber-coated steel bullets, sound bombs and were chased into the village. .
As a result, many civilians suffered tear gas inhalation and others sustained bruises as Israeli soldiers beat them after an Israeli soldier attempted to arrest a 12-year-old Palestinian child, beating him on his broken left arm and hitting his head at a rock then eventually attempting to strangle him. Furthermore, the same Israeli soldier assaulted against a 14-year old, the boy's sister and his mother, 40, and another woman, 46, when they tried to prevent the detention of the boy. In addition, Israeli forces abducted an 18-year-old Palestinian youngster, and unidentified international solidarity activist. At approximately 13:30 on Friday afternoon, Palestinian civilians and international solidarity activists organized a protest in the center of Kufor Qaddoum village, northeast of Qalqilya, heading to the eastern entrance of the village in protest against closing that entrance since the beginning of al-Aqsa Intifada with an iron gate. When they arrived at the entrance of the gate, the demonstrators were met by live bullets, tear gas canisters, rubber-coated steel bullets, sound bombs. As a result, five Palestinian civilians were wounded. The first civilian, 36, was hit by a bullet to the right foot; the second civilian,46, was hit by a bullet to the right leg; the third civilian, 45, was hit by the bullet to the left leg; the fourth civilian,46, was hit by the bullet to the arm; and the fifth civilian, 15, was hit by a bullet to the head. At approximately 17:00 on Saturday, 29 August 2015, Palestinian civilians and international solidarity activists organized a protest in the center of Kufor Qaddoum village, northeast of Qalqilya, heading to the eastern entrance of the village in protest against closing that entrance since the beginning of al-Aqsa Intifada with an iron gate. When they arrived at the entrance of the gate, the demonstrators were met by live bullets, tear gas canisters, rubber-coated steel bullets, sound bombs. As a result, an 18-year-old youngster was wounded by a bullet to the right leg.